At Traction® Tools, we’re big on remote teams. While we’re based in Chicago, people at every level of the company are spread out all over the United States, and beyond! Remote workers are incredibly important to our success, so it’s incredibly important that we understand all the challenges and pitfalls that can get in the way. If you use remote workers at your company, chances are you have people from other cultures on your team. If so, congratulations! Multicultural backgrounds provide a broader range of perspectives, drive innovation, and nurture personal and professional development. Culturally diverse work teams are also more productive and perform better. But cross-cultural communication can be a challenge for any team—especially if you’re not communicating face-to-face. Language and cultural norms can suddenly feel really abnormal when you’re interacting with different cultures. Even non-verbal cues can be misinterpreted. For example, giving the “OK” sign in one culture could get you into a fight in another one. If your cross-cultural team is going to perform at the next level, you’ll need to learn how to understand and communicate with each other. Let’s look at practical ways you can develop better communication with your remote team. What does it mean if your Asian team member is silent? Why does your German coworker disagree so forcefully? Does it frustrate you that your Russian colleague seems more interested in social chat than the business at hand? And why are you the only one who dials into the meeting on time? Different cultures have different values, and those values come out in their communication norms. If your team isn’t aware of them, you’ll get frustrated and your collaboration will suffer. But you can nip it in the bud by training your team members to communicate cross-culturally. Each culture relates to work, time and relationships in its own unique way. These cultural norms come out in the way we communicate with each other, like a language of its own. When we understand the cultural language, our communication is smoother at all levels. If we don’t know the cultural norms, we’ll misinterpret signs that look familiar to us but have much different meanings. With all those potential differences in culture, how can anyone hope to work effectively across cultures? The number one thing is to start with an attitude of humility and respect. Do that and you’re halfway there. Your team members will forgive a gaffe if they know you’re trying. But it’s still critical to learn how different cultures communicate and do business—and how they perceive you! When everyone understands each other’s cultural differences, you’ll find your team humming along and getting more work done. And who knows? You just might find yourself enjoying your work more if you adopt certain values from other cultures! Start by acknowledging that you’ll have cultural differences. Set an expectation that everyone will respect one another’s cultural norms. Learn about your teammates’ cultures. Do some basic research on each culture’s business communication styles. Establish your own communication norms for the team. This will probably be an evolving set of agreements. Get face time together. Non-verbal communication can help prevent many misunderstandings. Don’t assume you’re being understood. Avoid idioms and clichés that could be misinterpreted. Frequently ask if they understand. Taking small steps like these will have a tremendous effect on your remote team’s cross-cultural communication. They could be the difference between constant underlying tension and a team that spurs one another on to greater work. Go Farther with Your Remote Team! Get more help to improve your remote teams’ communication and collaboration. 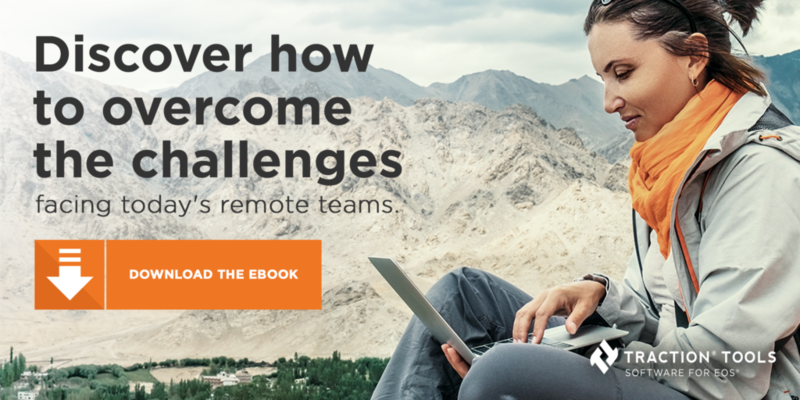 Check out our new ebook, Far Better: A Better Way to Collaborate with Remote Teams. You’ll get expert insight into the biggest challenges remote teams face, and how to get to the next level of production. You’ll discover key ways to boost communication, morale, and productivity when working with remote colleagues and teams. Traction® Tools is an officially licensed provider of EOS® software. © 2018 Traction Tools. All rights reserved. EOS® logos and process are owned by EOS Worldwide.